Before celebrating the ultimate fulfillment of God’s promises in Christmas Eve Candlelit Worship, let’s get together. If you’re looking for people to be with at this time of year, Illumine’s Christmas Eve get together is a perfect way to enjoy the holiday. Expect cookies, a hot chocolate bar, collaborative art, and a chance to make some new friends. Nobody should have to be alone at Christmas. If you've got people to be with - that's great! This event isn't meant to "get in the way" of any family's Christmas traditions. For many in York County, though, Christmas is a time for missing family who lives far off. Let's get together for a couple hours before we celebrate Jesus' coming to be with us. Let's play some games and sip some nog and have some fun. Nobody should have to be alone at Christmas - and now, if you don't want to be, you don't have to be! Dive into the season with Illumine! Tons of fun and a great way to serve the community by beautifying our campus. Join us for a night of trivia and fellowship. For students in grades K4 - 5. Join us for a night of Christmas trivia and fellowship. 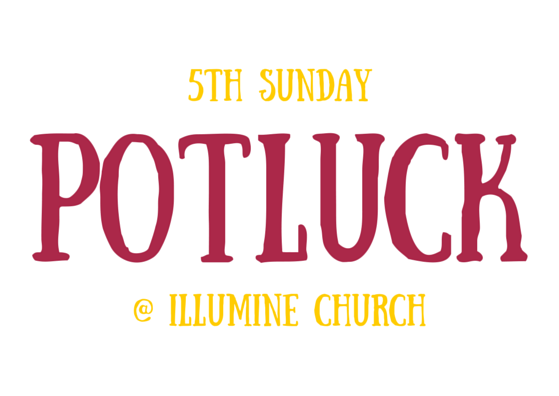 Every time a month has 5 Sundays, Illumine has a potluck! Everyone is invited and it is a great way to connect with new people. You're welcome to bring a dish to share, but even if you can't, please feel free to stay and enjoy the fellowship. There's always plenty to go around. It's trivia night, Christmas-style. All the teams, challenges, prizes, and fun wrapped up and tied with a bow. All aspects of the holiday season are on the table, from the Biblical account to the North Pole. Everyone's invited - and if you can, bring some delicious Christmas cookies along to share. It's a great opportunity to get to know people here at Illumine. Since we have so many new faces all the time, it's good to take advantage of every opportunity we get! Lutherans throw pretty awesome potlucks. For serious, though. They rock. Every time a month has 5 Sundays, we take advantage of the occasion and enjoy a great meal together after worship that Sunday. Whether you bring a dish or not, join us for some fun and fellowship.